Bill Henderson Sr., 87, who died in late May, operated woodworking businesses in Paynesville for 35 years and served two terms on the Paynesville City Council. Bill Henderson, Sr., 87, who operated woodworking businesses in Paynesville for 35 years, died in late May. He also served eight years on the Paynesville City Council. The St. Cloud native moved to Paynesville - his wife Maxine's hometown - in September 1945 and started Henderson Boat Works Company, building cedar strip boats and cabinets. 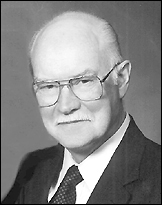 In 1949, he joined Don Hanson in the Henderson-Hanson Company, building houses in partnership until 1958, when Henderson started his own woodworking shop. Henderson Woodwork Company was located on James Street in downtown Paynesville for 20 years. Among his projects were the bank fixtures (for both banks in Paynesville in the 1960s plus for other banks in and out of the state), cases at Paynesville High School (which opened in 1969), and the altar, cross, and baptismal font at Paynesville Lutheran Church. Henderson Woodworking moved to a new building on Pomeroy Avenue in 1978. Bill Sr. sold the business to his son Bill Jr. in 1980, who in turn sold the business in 1991, when it became Paynesville Wood Products. Henderson was elected to the Paynesville City Council in 1974 and served two terms (eight years), choosing not to run again in 1982. He also served the community as scoutmaster, as a charter member of the Paynesville Lions Club, as a firearms safety instructor, and as a member of the Sportsmen's Club, the Chamber of Commerce, the Koronis Lake Association, and Paynesville Methodist Church. He and his late wife, Maxine, played in the Retreads, a local musical group, and had visited each Minnesota State Park. In retirement, he continued to enjoy woodworking as well as lapidary, silversmithing, fishing, tying flies, and reading. His funeral was held in June.